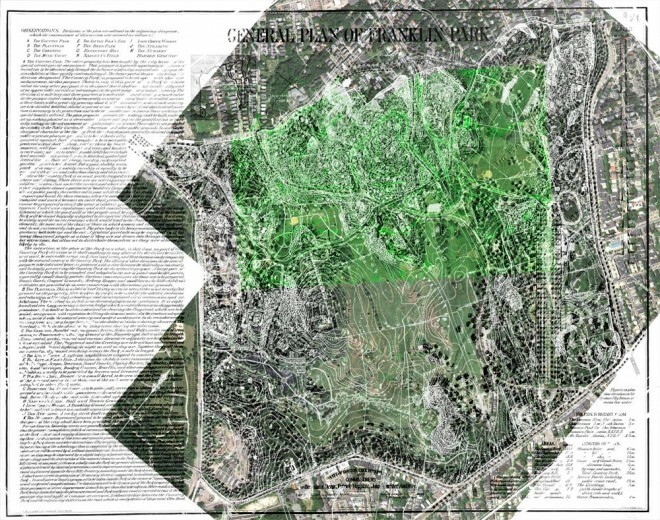 Several maps of Franklin Park overlaid: Olmsted’s General Plan and Revised General Plan, along with a pre-plan topographical survey and, inset, a post-construction map of Schoolmaster and Hagborne Hills — all layered over a contemporary Google Maps view of the park. In 2010, my wife and I bought a place on Gartland Street near Franklin Park. Having moved to Boston’s Jamaica Plain neighborhood in the mid-90s and lived there for many years, I always thought of the park as a dark and dangerous place. To speak of Franklin Park was to invoke images of crime and drugs, of bodies hidden in the woods by mysterious criminals, and of shady acts committed with a nod and a handshake under darkened stone ruins lit only by the flicker of lightning. If you just picture the opening scene to any episode of “The X-Files” you get the idea. So I was surprised and happy to discover that Franklin Park is actually a great place, full of beautiful woods and broad open fields, sprinkled with ponds and stone bridges and quaint 19th century sights. I began jogging in the park (sans chien, much to the chagrin of my dog-obsessed neighborhood) and for a year or so I stuck to the paths and saw the vistas Olmsted wanted me to see. A postcard showing one of the bridges over Scarborough Pond. From Boston Public Library, via Flickr. Once I got bored with the pond and the circuit, I started venturing into the park and stumbling upon interesting and unexpected sites. Ruins of buildings; lost and forgotten areas; and a history that was much richer than I had expected. At first I was only intrigued, not venturing past the Wikipedia entries, but then I became obsessed. This is not a new thing, I suppose; I become obsessed at intervals and tend to make work out of it. At this point I have no idea what Franklin Park means to me, but I am there every day with a camera, digging into these ruins that are neither lost nor obviously found. 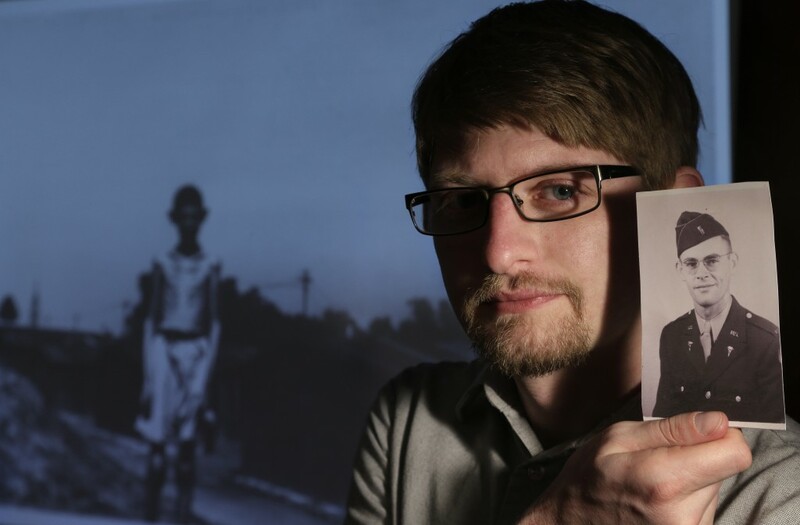 I love standing on a bit of dirt, a piece of ground, and knowing that I am experiencing both history and the present. It is an understanding that I carry with me all the time, but fully appreciate when it is thrown into full relief by confrontation with the gulf between “then” and “now” — to stand and stare at lost history is an amazing thing. I imagine this is why thousands venture every year to the Coliseum, the Parthenon, the Great Wall and so many others. For me, Franklin Park holds all these wonders and it is right outside my door. 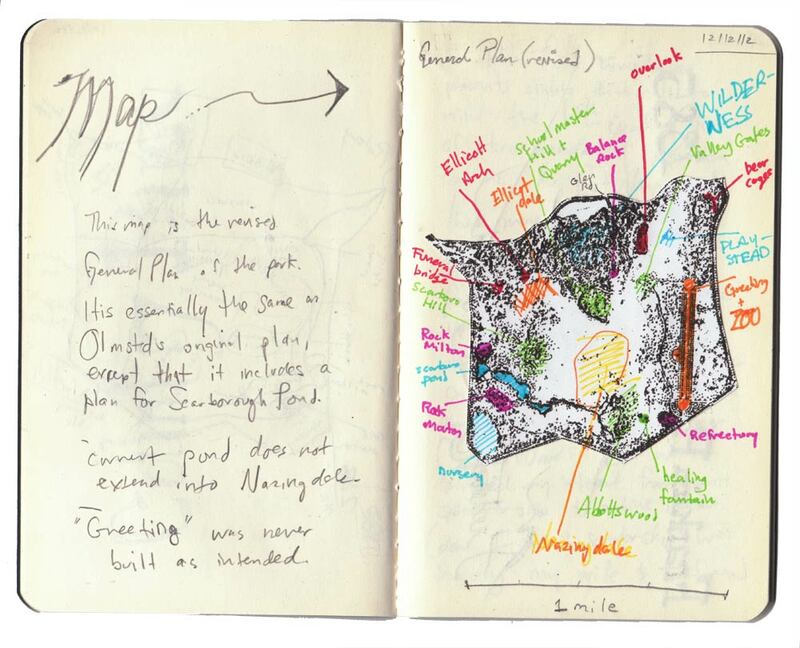 These meditations on Franklin Park won’t reveal anything you can’t find elsewhere. I’m not interested in history as fact. I’m more interested in the emotional and psychological space of 537 acres in the heart of Boston, and what can be learned by standing on those ruins and pondering the intersection between Olmsted’s 19th century intentions with my 21st century reality.